Two little yellow bears for today's bento. Can you guess what I used to make the yellow bear? Yup, I made it from hard boiled egg. Cut the egg white with bear shapes cutter and colored with turmeric that I mixed with water. The face parts were made from crab stick and nori and the flowers were from cucumber and carrot. I got some new food picks last month and decided to use the cute hat sets food picks for the yellow bears. Love those cute hat picks! Inside the other box : strawberries, chicken & corns meat balls, stir fry bean sprout with fish cake. Your bear faces are so perfectly done! *sigh* Don't know how you do it Lia. And so cute with their little hats!!! Chicken corn balls look yummy too... 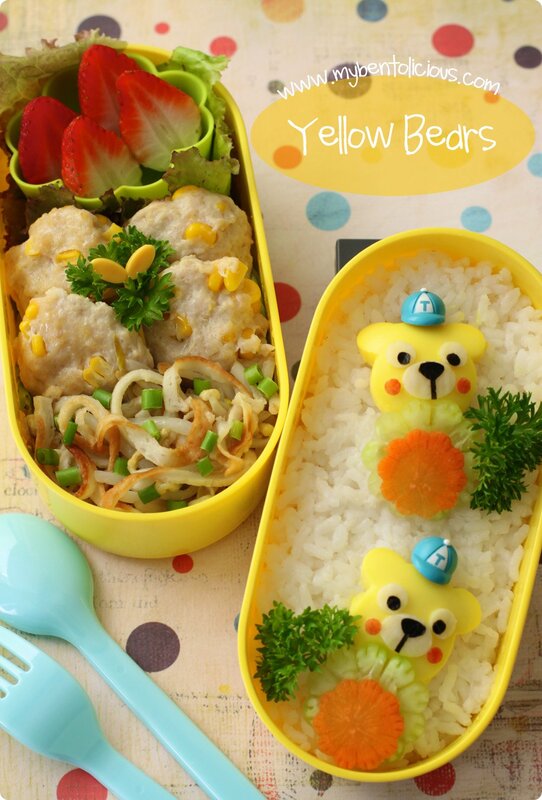 Sunny and sweet bento! First of all, thanks for the BOMB shout out! You are so sweet to support our fun monthly challenge. The bears looks so perfect and delicious! Thanks for reminding me about the BOMB challange! WOW! You're really creative! I must called you "Bento Queen" and the picks are so cute! Beautiful, I must get those bus picks :) I'm off to eBay to search for them! @Margot : Thanks a lot Margot! 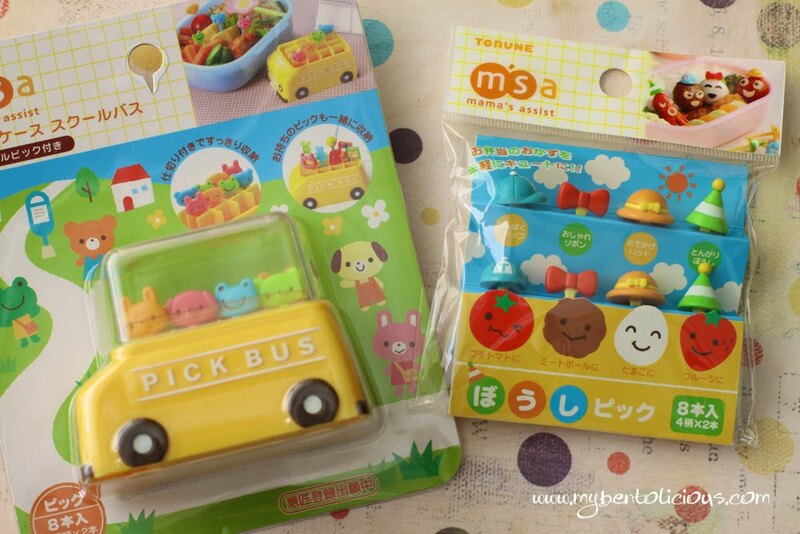 If you can't find it on eBay, you can try BENTO CRAFT(Malaysia) or J-MAMA & BABY(Singapore). You name one bento gadget, I'll for sure find it in your cabinet..haha...that's so cute! sherimiya said it perfectly--sweet and sunny bento! full of charm! thank you for this idea, my hard boiled eggs can now be more than just mold shaped eggs and chicks. cheers! the hat picks are great - makes these bears look like they are about to play baseball, haha! very clever to use the dyed eggs, and as always your delicate flowers are a beautiful accent. oh, and can i have some of that tasty-looking stir-fry, haha?! What patience to achieve all these little pictures, hear a thousand times! i'm not found your newsletter ? that is such a fantastic use of the new picks - such a lovely creation, as usual! @COLARGOL : Thanks a lot for your comment! Very kind of you :) What kind of newsletter do you mean? Or you mean news feed? These picks are so cute and suit the bears. As always your characters are well done. You are a master of using cute picks as well. The side car is full of yummy foods! great idea to use tumeric and egg white for the cheery yellow. very cute! Never would have guessed the bears were made from eggs. It looks so perfect too! Ahhhhh! The picks are too awesome! Must get!